We are very proud to have such a dedicated team of Physiatrists, therapists, nurses, social workers, neuropsychologists, trainees, and staff who are focused on making a difference in the lives of people with disabilities to improve their quality of life. The Rehabilitation unit at the University of Rochester medical center in Strong Memorial Hospital is one of the oldest hospital-based rehabilitation programs in the state and provides inpatient and outpatient rehabilitation services for patients recovering from a variety of conditions. The University of Rochester Medical Center is one of the nation’s top medical centers, and is at the center of the University's health research, teaching, patient care, and community outreach missions. The University's health care delivery network is anchored by Strong Memorial Hospital, an, University-owned teaching hospital - which takes pride in programs that consistently rank among "America's Best Hospitals," according to U.S. News & World Report. In regard to service, Strong Memorial Hospital is the major referral hospital for this region and is also the major teaching hospital for the University of Rochester School of Medicine and Dentistry. Strong Memorial Hospital and its Level I trauma Center, was one of those original “Reputational Magnet" hospitals first in the Rochester and surrounding regions to achieve the prestigious honor. It is the highest and most prestigious honor an organization can receive for excellence in nursing and quality patient care. This international quality nursing designation is awarded to only about two to five percent of hospitals in the country is a key entry point for many of our patients and others referred by medical facilities and providers throughout the region. Founded in the sixties, the Rehabilitation unit was one of the region’s first hospitals dedicated solely to rehabilitation. Our long and focused history has allowed the Rehabilitation services to develop a level of expertise that has become a regional resource and a model in the state of New York. 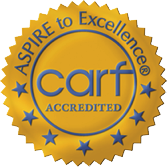 CARF-Accredited – We are the earliest inpatient CARF (Commission on the Accreditation of Rehabilitation Facilities) and Magnet-accredited rehabilitation units in upstate New York to be integrated directly with both a Level 1 Trauma Center and a Joint Commission-certified Comprehensive Stroke Center. Housed in the 850 bed tertiary care hospital, with expert multidisciplinary teams, was tied for fourth in New York in the latest hospital rankings from U.S. News & World Report. Our rehabilitation unit at Strong Memorial Hospital has special expertise in the region that cares for spinal cord injury (SCI) patients with past participation in the SCI Model Systems of Care. These designations reflect higher patient satisfaction and better patient outcomes. We provide high quality expert medical care for complex and complicated disabling injuries and illnesses with our 13 PM&R physicians. (Physiatrists with subspecialty certifications in Electro-diagnostic studies, pain and Spinal Cord Injury Medicine with our Medical director, Fellowship trained in Geriatric Rehabilitation one of the handful in the country),an emergency room physician 2 neuropsychologists, a nurse practitioner, experienced certified rehabilitation nurses, highly skilled Physical and Occupational, Speech language pathologists and a Recreation therapist. We offer rehabilitation through the lifespan- pediatrics through geriatrics and our patients and families have seamless access to our inpatient, sub-acute rehabilitation and outpatient services through dedicated staff at our state of the art facilities. As one of the oldest residency programs in Upstate New York, we are actively involved in training the next generation of rehabilitation clinicians, with integrated four year training program that is accredited by the Accreditation Council on Graduate Medical Education with 12 residents participating. We participate in the residency match thru ERAS in selecting the candidates for the program. Here is what our patients think about us.